It’s safe to say that turmeric has become one of the “superstars” of the superfood world—and for good reason. Literally thousands of studies have attested to its remarkable and far-ranging benefits, and researchers have still barely scratched the surface of its potential. It’s one thing to say that superfoods are “good for you,” but mainstream medicine is extremely hesitant to admit that mere foods and spices can actually prevent or treat illness. The tide is turning, though—a new research movement has grown up around “functional foods,” which are defined as foods (or therapeutic components within food) that can be used to treat acute diseases and conditions. Unsurprisingly, curcumin (the most well-studied beneficial component within turmeric) excels as a functional food. There seems to be no end to what this miraculous spice can tackle. Let’s take a look at some of the proven, ailment-specific benefits born out by research. While this list barely scratches the surface of curcumin’s healing potential, it effectively illustrates its promising future as a natural medicine. Curcumin is perhaps best known for its potent anti-inflammatory activity. A wealth of research has demonstrated that it relieves inflammation at its roots by inhibiting the release of pro-inflammatory chemicals, all without any of the damaging side effects of NSAIDs and prescription painkillers. Because it works to quell inflammation at the source, curcumin is helpful for nearly all types of pain. Studies show that oral supplementation helps calm delayed onset muscle soreness after physical exertion, reduces postoperative pain, and relieves the painful symptoms of premenstrual syndrome. It also reduces the pain associated with a wide range of inflammatory diseases—such as arthritis, dyspepsia, and ulcerative colitis—all while treating the underlying condition (rather than simply masking symptoms). One unintended consequence of internally consuming curcumin is radiantly healthy skin because of it’s full-spectrum anti-inflammatory activity. Researchers have found that targeting inflammation is a highly effective way to treat a variety of skin conditions, including psoriasis. As nice as radiant skin is, it’s worth noting that curcumin’s benefits are much more than skin deep—researchers have found that it also works wonders for mental and emotional health. One landmark study demonstrated that eating curcumin is as effective as Prozac for treating major depressive disorder. Subsequent studies have found that it also exhibits remarkable efficacy in cases of atypical depression, and in conjunction with conventional antidepressants (in which case it decreases neurological inflammation and attenuates depressive symptoms rapidly). Curcumin also supports overall brain and nervous system health, boosts cognitive performance, and protects against the neurodegeneration that can lead to Alzheimer’s disease and similar conditions. Curcumin offers great promise as an ally for those struggling with type 2 diabetes and prediabetes. A study published in Diabetes Care that daily supplementation can prevent prediabetes from progressing into type 2 diabetes (participants took curcumin for nine months). Other studies demonstrate that curcumin also aids those who already have type 2 diabetes by lowering blood sugar, reducing insulin resistance, improving beta cell function, and reducing the risk of cardiovascular complications often associated with diabetes. Curcumin has even been shown to promote weight loss in individuals with or without metabolic syndrome. It accomplishes this feat by optimizing fat metabolism, reducing adipose tissue concentration, and aiding the transformation of white fat (the “bad” fat) into brown fat (the “good fat”). 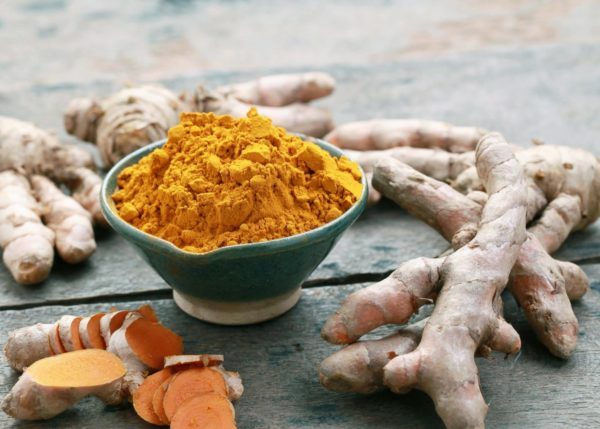 By working as a potent anti-inflammatory agent and antioxidant, curcumin effectively works on two of the greatest underlying causes of stomach disorders (inflammation and free radical proliferation). Additionally, its antimicrobial activity targets harmful bacteria while leaving beneficial bacteria intact, thus helping to balance the gut microbiome—which is essential not only for stomach health but also a staggering number of modulatory processes throughout the body. Studies have demonstrated that curcumin is an effective treatment for ulcerative colitis, irritable bowel syndrome, gastric ulcers, and more. Sold on Adding Curcumin to You Day? Try adding PuraThrive's Curcumin Gold to your daily regimen! It's a delicious liquid so it's easy to add a tablespoon to your tea, drink it with water, or even just take it straight off the spoon. Their patented Micelle Liposomal Technology offers 185x absorption than just eating turmeric or taking a typical supplement. They use all natural ingredients like curcumin extract, ginger oil, and DHA, to create their powerful blend and deliver the maximum anti-inflammatory results to your body. Do you use curcumin in your routine? Tell us how it makes you feel in the comments below! Your site having very useful contents , Keep posting more about beauty tips . Thanks for sharing. I take turmeric capsules daily and use turmeric in my cooking wherever I can. I started this because of painful osteoarthritis combined with a stomach that can’t tolerate NSAIDS. It works VERY well–in fact better than drugs as long as I remember to include it daily. BTW I find that adding powdered turmeric to my food seems to be more effective than capsules. Turmeric has more than just curcumin in it, and it’s quite possible that there are other elements that have a positive effect. Additionally my skin has improved markedly and I suspect that it has also helped my chronic depression–to the point where I am looking to get off of long term anti-depressants. All of this, and NO downside!